My knuckles ache. My palms are damp. My fingertips have that raw, depressed feeling I remember from learning to play the guitar. My eyes feel like they’ve been pushed into my head by unseen fingers, as if to quell a migraine. My temples are taut, my mind fuzzy. Everything seems farther away than usual. My chest feels like I’ve been out for a run, tight and tense and scratchy. My heartbeat threatens arrhythmia. My limbs are weak and heavy. I feel like I’ve been bashed around in the mosh-pit at a metal concert, or just returned from swordfighting class, tender and limp and exhilarated. I’ve done neither. The only thing I’ve done for most of today is play Thumper, and I’m exhausted. 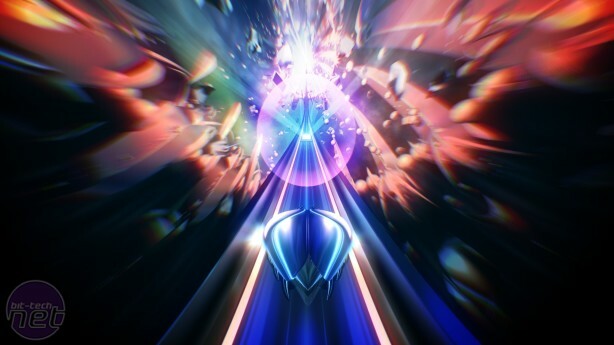 Thumper is incredible. It’s like nothing I’ve ever played before; a rhythm game from another planet where the gravity is crushing and the atmosphere unbreathable. It’s a relentless, white-knuckle juggernaut that doesn’t so much absorb you as entrap you. I want to say you absolutely have to play it, but I’m not sure if I can. This cannot possibly be good for you. It’s like drinking fermented spiders, simultaneously intoxicating and disturbing. What are you? You’re an insect; a tiny, juddering bullet-bug propelled along the muzzle of an infinite rifle into a terrible, kaleidoscopic abyss. 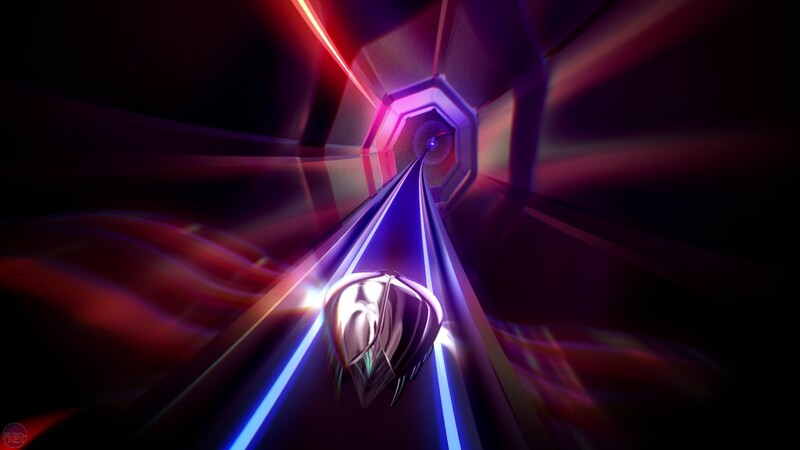 Wordlessly, Thumper teaches you how to survive itself, how to punch the right button in time with its irregular, deceptive beats, how to scratch and scream around a corner in a way that doesn’t strip the carapace off your back like a lion’s tongue on human skin. How to burst through its rhythmic barricades, how to spread your wings and leap off the slick chrome rail that guides you ever onward, shattering the frozen loops that hover enticingly above it. 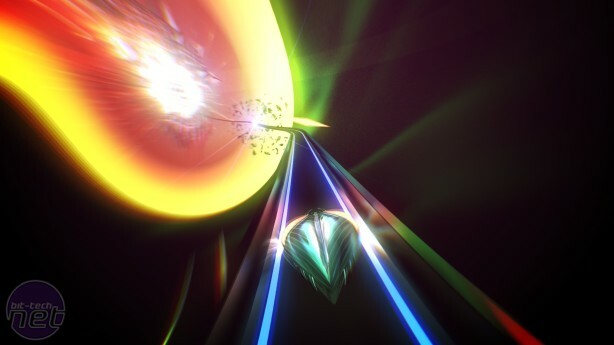 In most rhythm games, missing the beats damages your score. 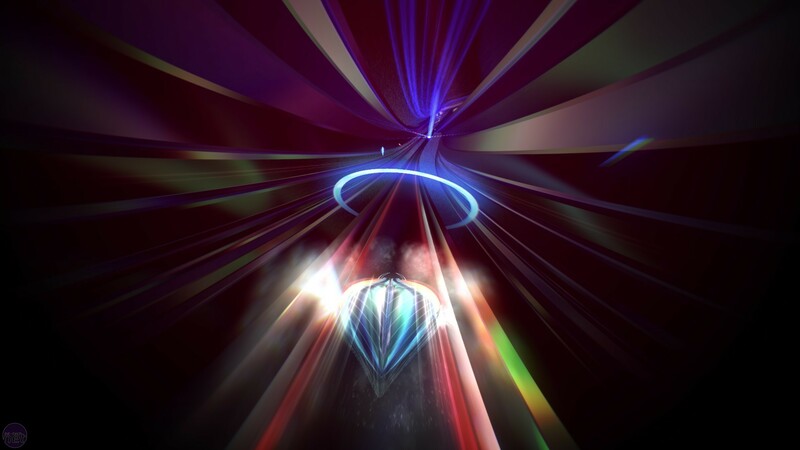 In Thumper, missing the beats could cost you your life. One ill-timed button press will leave your gleaming beetle naked and vulnerable. A second will shatter it like glass, catapulting you back to the previous checkpoint, to start that particular stage over again. Reaching the end of a stage will restore any lost health, as will hitting specific glowing panels at certain points along the way. Thumper boasts a total of nine levels. But they are long levels, some comprising as many as 30 stages, each of which lasts anywhere between 30 seconds and a couple of minutes. You’ll probably push past the first three levels fairly quickly, feeling like you’ve just about got a handle on the game as the stages gradually layer in the complexity. It’s after this point where the game that is Thumper actually begins, and you go from controlling your little bullet-bug to hanging onto the back of it by your fingernails, legs flailing behind you like windsocks in a gale.